From everyone here at Cheech and Chong Fans Dot Com. 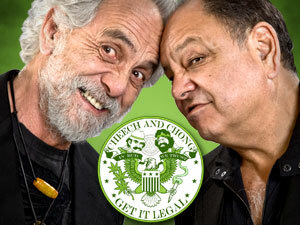 Great interview with Cheech and Chong. Tommy says he went to jail for something which is now legal. "We won the war on drugs," Tommy Chong says. On June 20th, the Cheech and Chong Up in Smoke tour featuring WAR is coming to the Twin River Event Center in Lincoln, Rhode Island. I guess the December 12th Cheech and Chong/WAR show at Bergen PAC in Englewood, New Jersey isn't selling well because they're now on GROUPON.